Here's a quick Garmin eTrex 10 techno adjustment that seems to reduce aimless wandering when elementary students tackle GPS activities like Hide-N-Seek. 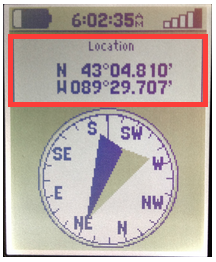 In a nutshell: Add current location (GPS coordinates) to the eTrex 10 compass display to provide realtime tracking of longitude/latitude changes. The following setup procedures adjusts eTrex 10 Compass Display Screen. Select "Profile Change" then select "Recreational"
Highlight/Select "Change Dashboard" then select "Large Data Field"
Scroll thru Fields (alphabetically) to find/select "Location (lat/lon)"
Usage - Students navigate using compass display. Wander until Location on Compass = Target Destination!